Arlene Simpson, 95, of Webster City, died Thursday, June 7, 2018 at Southfield Wellness Community. Funeral services will be held at 10:30 a.m. on Tuesday, June 12, 2018 at Foster Funeral and Cremation Center with Pastor Richard Laird, officiating. Burial will be held at Graceland Cemetery. Visitation will be held from 4:00 p.m. to 6:00 p.m. on Monday, June 11, 2018 at the funeral home. 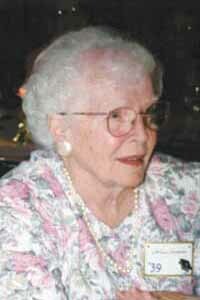 Winifred Arlene Buckles, was born August 11, 1922 in Webster City, the daughter of Aaron and Maude Bateman Buckles. She graduated from Webster City Schools in 1939, then attended Webster City Junior College and received her Bachelors in teaching from the University of Northern Iowa. In the summer of 1942, Arlene went to Milwaukee to work at Briggs and Stratton making magnetos for fighter planes to help the war effort. She married Hio Simpson on August 4, 1946 at the Universalist Church in Webster City. Arlene began her teaching career in a rural one room schoolhouse. She was a 5thgrade teacher with Webster City until her retirement in 1984. Arlene is survived by her children, Patricia (Fred) Foster of Staunton, VA; Jill (Don) Christoffersen of Kimballton, IA; grandchildren, Melinda (Brett) Wills, Katie (Randy Mains) Christoffersen, Travis (Kelly) Christoffersen; great-grandchildren, Aaron Wills, Bryan Wills, Eva Christoffersen and Kenneth Christoffersen; sister, Phyllis McKinney of Webster City; several nieces and nephews. In addition to her parents; she was preceded in death by her husband, Hio in 2016; daughter-in-infancy, Martha Simpson; brothers, Wilbur Dean Buckles and Richard Dwight Buckles. She was an active member of the New Testament Church of Christ and the VFW Auxiliary. Arlene enjoyed knitting, sewing and quilting. She would tie quilts at St. Paul’s Lutheran Church and knitted baby caps for newborns at the hospital.